Looking to rent or buy Concrete Stamping Tools – Basketweave Used Brick Pattern by Increte Systems SBBS S001 in Rochester NY, Ithaca NY and Western New York? The Duke Company proudly has proudly earned an A+ reputation for customer service and the best service for prompt pick-up and delivery. 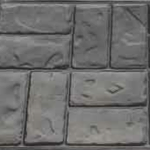 The Basketweave Used Brick decorative concrete stamping tool provides a realistic and durable pattern and finish and is 32 inches x 16 inches. Increte Systems, a division of Euclid Chemical, is a leader and pioneer, for over 50 years in providing professional solutions for decorative concrete. The company’s distribution facilities are based in Odessa, Florida; Kirkland, Illinois and Fresno, California. Looking to Rent Equipment to Support Your Decorative Concrete Projects?